@HumbleTrader : Noted. We will certainly take your advice. OK i want to make something clear here. The only thing i verified is that the other seller had the funds/resources available to back up his claim to be able to pay out if traders lose their accounts, and that i have all the personal details of the seller including passports/utility bills, etc, should they break their promise/guarantee and a trader contacts me with proof, so that i can share the sellers personal details with them and they have a place to begin action against them if they wish. So, i verified one specific aspect of their claim (that they have sizeable cash resources, which they do), it is by no means an endorsement of that service... infact this particular point has made me very worried because people are misunderstanding it as me endorsing and verifying the returns - i don't, and neither do i think that service will necessarily produce good returns. I will never again verify anything for any seller because of this. It's pointless for me to do so and only exposes me to personal risk for absolutely zero return. At the time i did it because I do thought it was an outlandish claim and was interested to know if they actually had the sizeable resources they claimed (they did have those resources...). Back on the topic of this service, i agree sellers should be careful with their wording, guaranteeing 200 pips a month is a big thing to say and worrisome if you happen to have a customer who is trading a massive account who then tries to cash in on that claim. Our sincere thanks to HumbleTrader and Donna for the valuable advice regarding the wording. We have edited the posts with the following correction : guarantee replaced with "assurance". Our marketing team will also carry out the changes on the website shortly. We did not intend to misguide members with the wording, it was an unintentional oversight on our part. I had given this testimonial to Phibase and am posting the same here as i have been running phibase eas for long and shited to forexsignalport cloning ea last month. I used to run Cabex, index and raybot on 8 accounts, iprofit was run on EU, GU and Gold on 4 accounts trading part of my capital. When i loaded FSP ea first thing immediately noticeable was how easy it was to get up. Earlier I had to attach 4 eas on 8 charts. So changing mt4 or installing updates it was going thru the setup and checking of nearly 50 charts. Really painful process when i think about it now. with fsp its just loading on one chart... i have it running on all 8 accounts.... just had to attach to 8 charts and i am done.... that is almost 80% less work for me. Next most obvious was vps memory used has come down from around 230 mb to less than 45 mb for each mt4 now. I also see cpu usage around 30% most of the time... spikes to 90% every now and then..... earlier it was almost always at 90% or 99%. I still have my vps at 4gb memory and 4 cpu cores.... i think i can scale down to 2GB and 1 cpu core now.... that by itself would save me $600 every year. third major difference: have about 58 closed trades... each one of them identical across ICM, AXI and ATC. I also on Oanda (no gold) using splitting trades across two accs. I used to see atleast 3 to 4 trade variations per week... not its my third week and 100% identical trades. I really appreciate phibase for solving this nagging issue. Earlier, my risk was set higher for cabex and raybot. now it is evenly distributed across all eas at 3% per trade and my full capital looks better utilizied . mike these are valid points, but i would still rather do the EAs, to be more hands on, and customize a bit more, and not have to deal with slippages that will EVENTUALLY come on a copier (as you have their slip plus a copier slip, plus your slip all for potential to add up). You can run all these EAs on one account on a VPS, and its not going to make a huge difference. You also have two servers to worry about going down or disconnecting instead of one. So I appreciate your review. But it is not perfect and is highlighting most of the pros. I have bought, and lost money with virtually all of phibase EAs from synergy to cabex (have not given index a try yet). My approach with them going forward is to take a long patient road. I don't care about the signal, but will be watching index for a long time first and see if it lives up to claims. But my experience with their EA performacne historically has been poor - to average at best. And I can live with average to be honest if it can be sustained. Will keep an look in on this. I will add that on the flip side, I feel that this is an honest vendor who is trying hard. Just that has not had a lot of luck in the past. I hope that that might be the natural learning lessons needed to improve things as very few of us get it right the first time. I have bought, and lost money with virtually all of phibase EAs from synergy to cabex (have not given index a try yet). I also. Interestingly, there are people who earned on these EAs? Same ,only lose money with Phibase Eas, support is really good but it does not give money. Also mike, when i look at the trades, it looks like almost all of this years growth has come from the freak JPY spike on Jan 3rd. The same spike that crashed many accounts. So basically they got lucky on a GBPJPY trade during the flash spike that made 8% of their 10% growth. The flash spike could have easily worked against them to but they lucked out on the right side. Sorry, i am not trying to ruin your review. But just help put it to a more clear perspective. I do really like your idea though of adding funds in to the periods of drawdowns. It is a smart strategy. adding funds when cabex went south cant have worked out good, simply impossible looking at the account below. strategies can fail as we all know by now and one has to accept that when they do and preserve capital to fight another day. here below is a manual trader who did not know this basic rule. with signal port = being diversified i think this has a good chance of being a long term profitable, but only time will tell. jwatts7701 100% agree with you,its was present from market,in the future in my opinion will be flat ,I hope I am wrong. I do not have confidence in Phibase,and I will just watch, hope you succeed. I think if everything goes well, you will earn 10 percent in a year, too many weak strategies in this portfolio and they will drown Raybot. So basically they got lucky on a GBPJPY trade during the flash spike that made 8% of their 10% growth. The flash spike could have easily worked against them to but they lucked out on the right side. We acknowledge the role of luck in trading, however any trading or strategies cannot survive on luck. We believe that any trader or developer can only put odds in their favor by a small percentage and use proper risk + trade management to make reasonable gains. The positive R/R enables INDEX (along with trading uncorrelated pairs/timeframes/strategies) enables it to recover from losing phases much faster than any of our other strategies. INDEX GBPJPY trade was open with floating gain of +200 pips prior to the current crash. The trade had been open since 31st Dec. Flash crashes are generally seen in the same direction of the trend (may not always be the case – system failures can happen in any direction). 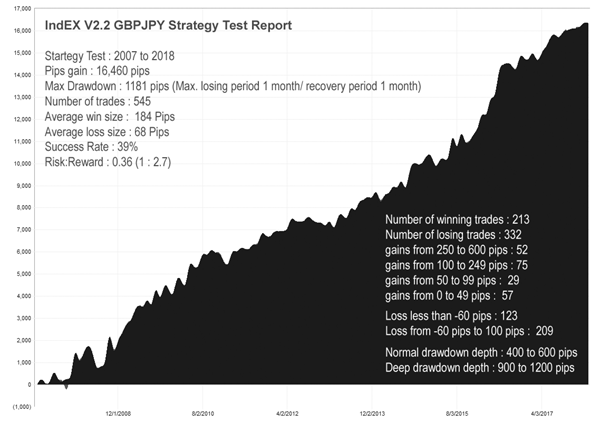 Phibase started trading Yen pairs only after INDEX strategy was developed – this is largely because the strategy has a lot more market information to factor into the trade. In most cases the overall trend direction is maintained. INDEX trades are likely to benefit from flash crashes. Among all strategies we have researched and developed, INDEX is relatively safest for trading Yen pairs – the risks associated are well compensated by the rewards offered by trading this pair. Please refer to the Phibase technical trade recommendation published on 2nd Jan 2019 : https://forexsignalport.com/Free-Manual-Technical-Trading-Signal-20190102-GBPJPY.html. A per this trade setup, a drop to 134 level was very much expected as it was the completion leg of the Crab Harmonic pattern. We are of the opinion that many large positions had stops placed below 133.8 level and once they got triggered, the slip to 131 was imminent. In case INDEX was holding a LONG prior to the current crash, the SL of 100 pips would have been triggered about 15 minutes prior to the 600 pip drop. In the rare event that the Phibase portfolio has a trade in wrong direction, the loss would be as per the risk level used and well within max drawdown expected. Assuming a worst case 500 pip drop with stoploss not being honored would lose about 10% of the equity (at default risk 2%). The equity loss would be 15% at risk 3%. – this is a risk that should be factored into trading. Many EAs/traders set risk based on most recent good performance without considering the max drawdown the system has seen in past – when trading with such risk, accounts are usually blown out. Grids/Martingales almost always blow out accounts during such events. We always recommend risk keeping in mind the worst-case DD – This makes our gains look smaller and lagging other EAs on performance leader boards. Our goal is to perform consistently over long term and give the strategies a chance to prove their potential. If I have to worry about server going down or disconnecting, the first thing I will do is change the VPS provider. When running EAs the last thing you want to worry is VPS issues. My provider, like most other VPS guys provides 99.9% uptime, but has never once let me down during trading hours in the past 5 years. System updates do happen occasionally but is informed in advance and takes place over weenend when market is closed. Never have the auto update feature on.... windows will definitely decide to do it and restart to look fresh and neat when you needed it the most . And.... trading is a game of probability. assuming my VPS has an uptime of 99% and assume phibase server is 99% (I am sure they should be aiming for 100%), what are the odds of both having common downtime... or any one having downtime and a critical trade in place... further all trades have a server side SL... The probability of uptime looks pretty favorable to me but as always no one is right all the time. I trade when things look good to me.... when in doubt never trade. I look at EAs as nothing but a trade. Its just like entering a manual trade.... have a goal, have a SL and trade as per plan. it is nothing but a tool. I do enough research on the EA.... in case of phibase i ask them questions... lots and lots of questions... they explain to me in great details... much more than what is there on their sites... when the support is good its best to make use of it and make things work.... I am not saying i did great gains in 2018... I made a okay gain... mostly due to Raybot... and timing of increasing risk as well as capital on INDEX (mid oct).... gains made are due to my money management and not solely the eas handiwork.... I would say i was able to use the tools well. I did ask phibase about the cloning slippage and inevitable lag that could be seen... I am convinced with the answers and the process they have used to ensure identical trading as their master accounts. I would have preferred to run stand alone EAs... have been doing so for, but over longer period variation across brokers is seen to be about 20%... for example at my risk raybot gained 55% on ICM, 62% on AXI, 40% on ATC.... I trade same amount on each account... these differences reduces my gain to just about 50% instead of 55%. I am sure broker differences will always exist when trading any EA.... phibase guys will be better off if they simply accept this and not tweak their eas too much to make eas work on good brokers as well as bucket shop brokers. They need to tell clearly their choice of brokers for their EAs.. I took great efforts to move to ICM and AXI.... I think its is upto us to give the tools/eas we use a good chance. I have been using the method of adding funds since 2012.... it was very thrilling at first, but after synergy, WS and turbit.... i became a bit more responsible and set some good rules and conditions for adding funds.... I also set up rules to take it out again as soon as the add-on funds served its purpose... the goal is to have 100% capital available outside your trading accounts all the time.... never go all out in..... so when i say i am trading with high risk 3%, it would actually mean i am trading only at risk 1.5% when taking the reserve capital into the picture.... i just dont trust the full money into any broker or expose it all. EVEN If all the brokers turn turtle... i dont have to stop trading or be at the mercy of some regulator. I once assume nothing could go wrong with brokers... FXCM really gave me the scare... and made me wiser. when we do things consistently i see that such negatives are more than made up by the gains they bring in...... ofcourse this is sure way to loose if trading bad strategies.... especially if the vendor is not honest with past data and backtests.... i just happen to trust phibase as a vendor and believe they are honest in their development of eas.